It could not have happened any other way, let's be honest with ourselves. The worst overall record in the Northwest League. No winning streak of 3 or more games at any point during the regular season. And the exclamation point to finish the season? A walk-off balk call to send the Ems to a 3-2 win in Game 3 of the NWL Championship Series to capture the title, their 5th playoff win in a row to finish their undefeated postseason run, sweeping the Indians in the finals 3 games-to-none. Down 2-1 heading into the bottom of the 9th, the Ems put runners on 2nd and 3rd with two outs and needed some clutch at-bats. Jake Slaughter took a 99 mph fastball from Spokane closer Emmanuel Clase in the back to load the bases, pounding his chest as he fired up the dugout. Andy Weber then worked a walk to tie up the game, bringing Nelson Velazquez to the plate. Then, improbably, unimaginably, Clase lost his balance on the delivery of the first pitch, dropping the baseball as the entire PK Park crowd erupted in disbelief. A balk. 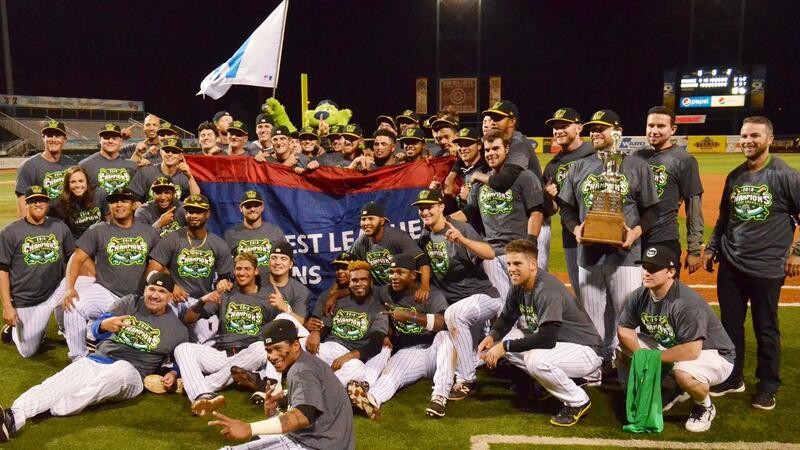 Because of course a balk ended the 2018 Northwest League season and crowned the Eugene Emeralds as champions. As a result, the Emeralds captured their 2nd championship in 3 seasons after a third consecutive trip to the finals. A run that has been unlike any other in Eugene's history, culminated in a way you'll probably never witness ever again in a championship baseball game. A balk. Yep, a balk. We still can't believe it either.